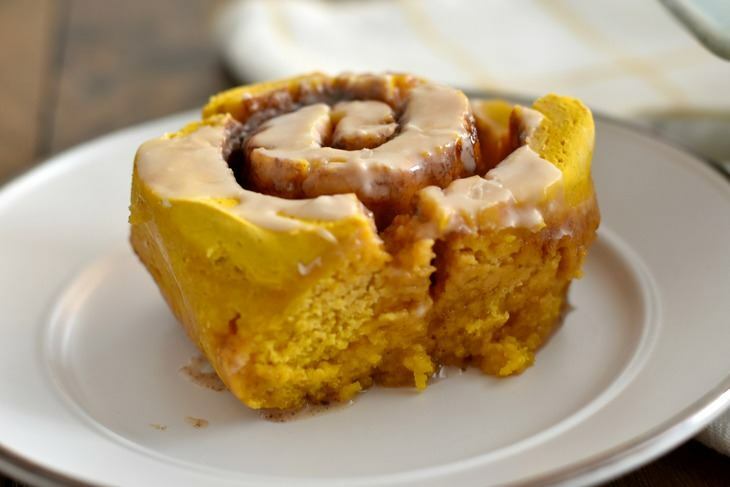 Gluten Free Pumpkin Cinnamon Rolls are the best way to indulge in all things pumpkin this fall season. 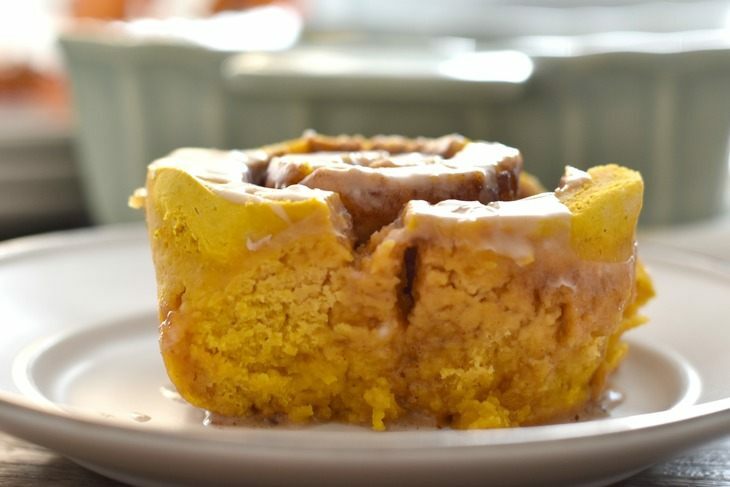 The maple glaze that smothers these easy pumpkin cinnamon rolls will rock your world. 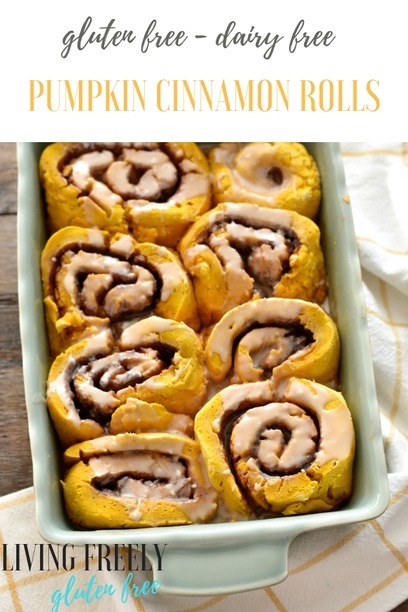 Make sure to make them at least once during this pumpkin season. I’m not going to sugar coat it- cinnamon rolls can be a task. The main reason why so many people tell me they avoid it is because they don’t like to bake with yeast, it intimidates them. I totally get it and I felt the same way before I started baking with it. Can you believe before I started this food blog I was a medeocore cook and baker. I followed simple recipes and never branched out of my comfort zone. Once I went gluten free I had to get out of that comfort zone in order to recreate the foods that I loved and craved. That meant baking with yeast because all the good stuff has it. Once I baked with it a few times it became super simple and it’s now a part of everyday life. 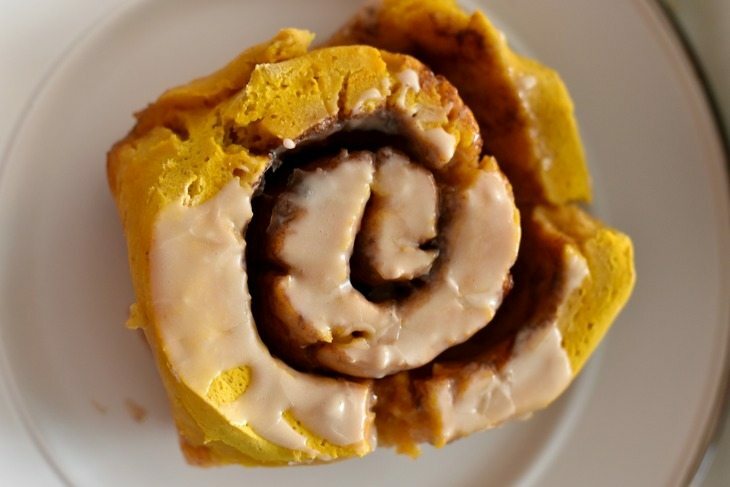 How do I make these Easy Pumpkin Cinnamon Rolls? 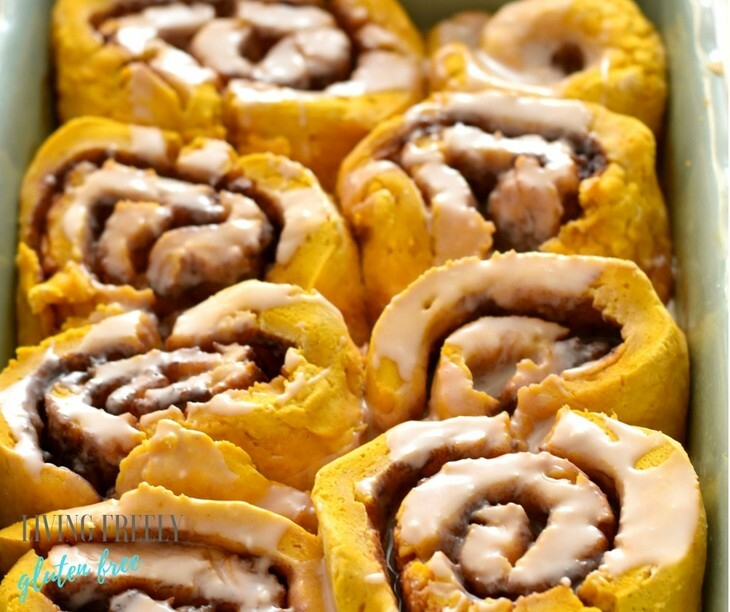 Gluten Free Pumpkin Cinnamon Rolls might sound like they will be a challenge, but the only part that can pose challenges is when you roll out the dough. 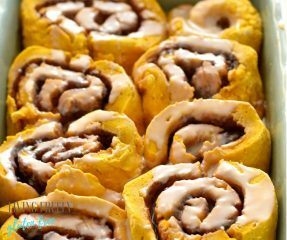 Once you know my fool proof method for rolling out the dough, you will feel super confident making these easy pumpkin cinnamon rolls. First you are going to start by making the dough. You will need to activate the yeast. To do this, heat the coconut milk to be warm and add the yeast and sugar. Once it doubles in size you are ready to go. In a bowl mix together the gluten free all purpose flour, tapioca starch, baking powder, xanthan gum, and salt. Set aside. Pro-tip: Not all gluten free all purpose flours are created equal. I highly recommend my personal blend. It is easy to make, inexpensive, and works perfect! Separate the eggs and beat egg whites on high for 2 minutes. Get them fluffy! Add 1 egg yolk in and then add the dairy free butter, mix for 1 minute. Add the yeast mixture and mix for another minute. Add the pumpkin and blend. Add the flour mixture slowly so you don’t make a mess. Mix for 3 minutes scrapping the sides halfway through. Once your dough is ready it is time to roll it out. Plastic wrap is your best friend. Line the countertop with it. Dust some powder sugar on top and then place the dough on it. Place another piece of plastic wrap over the top. Push it down to flatten it and roll it do be about 1/4″ thick. Make the sugar mixture. Spread the softened butter over the top and sprinkle the sugar mixture. Roll it up by grabbing the end of the plastic wrap and pushing the dough to the left. Press it down and then continue rolling by pulling up on the plastic wrap. It will lift from the counter and roll the dough at the same time. Now it’s time to cut the rolls and the secret to this is to NEVER use a knife. You want to use thread. Shimmy the thread under the roll and then pull the thread up to cut the roll. I make them about 2″. Place the rolls in a greased baking pan. Cover them and allow them to rise for about 30 minutes in a warm place like the oven. Then bake at 350º for 30 minutes. Allow them to slightly cool and then make the glaze and drizzle. Serve them warm and they are best eaten the same day. Pro-tip: You can’t make the dough the night before and bake in the morning. I tried. It loses it’s fluffiness and is much more dense. You and your entire family will enjoy them. My husband ate almost the entire tray to himself because my family members couldn’t get over to have some. He was ok with that though. Enjoy and happy fall! 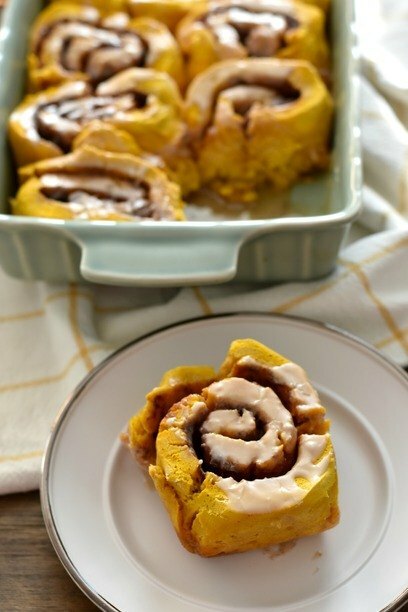 These Pumpkin Cinnamon Rolls with Maple Glaze and soft and gooey. You will love making them all fall. Activate the yeast by heating the coconut milk to be warm and then adding the yeast and sugar. Give it a stir and allow it to double in size. Sift the Gluten Free All Purpose Flour, Tapioca Starch, Baking Powder, Salt and Xanthan Gum. Separate the eggs, beat the egg whites on high for 2 minutes. Add 1 egg yolk to the egg whites. Add the vegan butter and mix for 1 minute. Add the pumpkin and yeast mixture. Mix for 1 minute. Add the flour mixture. Mix on medium low speed for 3 minutes scraping the sides of the bowl halfway through. Lay plastic wrap on your kitchen counter large enough to roll out the dough. Spoon the dough on top of the plastic wrap and lay another sheet of plastic wrap on top. You can sprinkle some powdered sugar on the plastic wrap to help with rolling out the dough. Roll the dough out to be about ¼ inch thick. Make the filling by adding the cinnamon, and sugars to a bowl and whisking. Spread the vegan butter on the dough and then sprinkle the sugar mixture on top. To roll them up- on one side of the dough grab the plastic wrap under it and push up to have the edge of the dough touch the dough next to it. This is the center of your roll. Gently press it to make sure it stays into place. You will now use the plastic wrap to help you roll the dough by pulling the plastic wrap off the counter and towards the dough. They should just roll into place while you do this. Once your dough is formed you need to cut them. Use thread for this. Shimmy the thread under the roll about an inch or so. Pull the thread up and towards the center to cut the cinnamon roll. Repeat. You will get 6-8 rolls. Grease a baking dish and place the rolls in it. It’s ok if they touch. Place a towel on top and stick in an unheated oven or microwave to rise for 30 minutes. Remove and preheat oven to 350 degrees F. Bake for 30 minutes. Allow them to mostly cool and make the glaze by adding all of the ingredients to a bowl and whisking until it is smooth. Pour glaze on top of the cinnamon rolls and serve warm. Enjoy!